With color number 80 (purple) cast on 33 sts and join in the round. Repeat rounds 1 and 2 two more times. Switch to color number 10 (berry pink) and knit 1 round. Switch to color number 50 (pistachio green) and knit 1 round. Slip first stitch of next round as to purl, knit rest of round and 2 more rounds. Switch to color 90 (vanilla) and knit 1 round. Slip first stitch of next round as to purl, knit rest of round and 1 more round. Switch to color 50 (pistachio green) and knit 1 round. Switch to color 10 (berry pink) and knit 1 round. Slip first stitch of next round as to purl, knit rest of round and 3 more rounds. 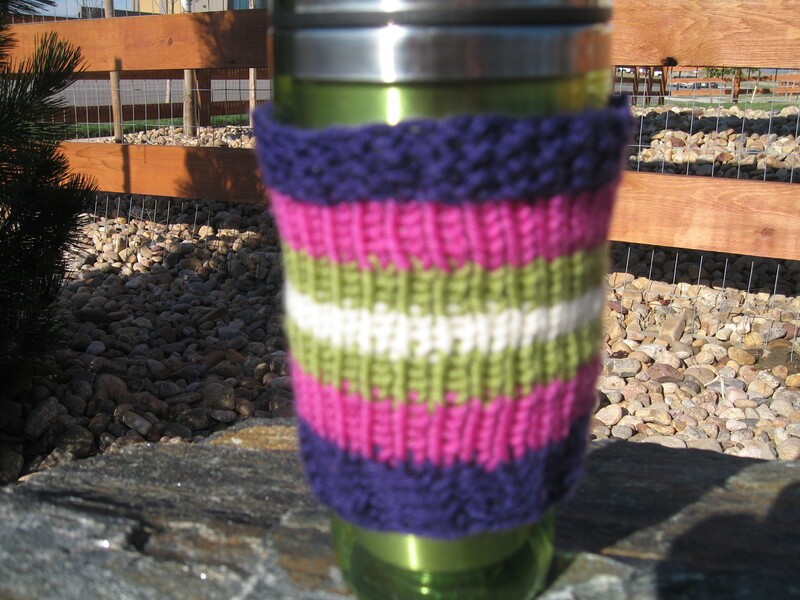 Switch to color 80 (purple) and knit one round. (k1, p1) repeat – due to uneven stitch number seedstitch pattern emerges automatically, so don’t start over at the beginning of each round, just keep knitting, meaning if the round ends with a knit, then start the next round with a purl. Bind off in pattern, weave in the ends. Go get a cup of coffee, save a tree by not using their carton ring around the take out cup but your hand knit “Mug Hug”. This entry was posted in Free Pattern. Bookmark the permalink. I can’t wait to make these… the colors are adorable! I thought you might like the color combination!